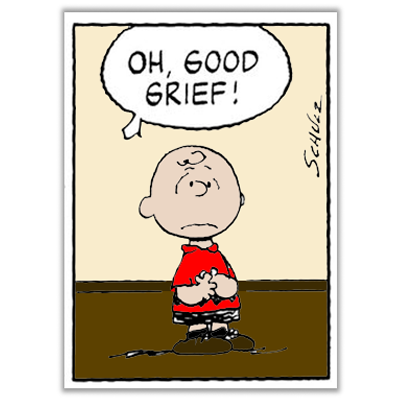 Home > Sermons > Oh, good grief! […]There is kind of secrecy to the process so that when Steve announced my resignation from this church last Sunday it felt sudden and abrupt and from left field. Thank you so much for how graciously you handled the announcement. I want to reassure you that my leaving is based purely on family issues. We find it such a struggle to live in a city, and so after many months of struggling, we made the decision that it was in the best interest of our family to move back to a rural lifestyle. She is leaving? Really? She can’t be leaving she has only been here a year. Moments such as this bring up all kinds of feelings; they hook into our other experiences especially moments when you have had other ministers leave or other times of loss and change. Sometimes it is hard to separate all those emotions, because they are not clean and in one moment we feel one way and in another moment we feel like something else. This is what grief is. Greif is about letting go, and living in change, and feeling all different sorts of feelings. Greif is about the complicated and complex emotional roller coaster that allows us to say goodbye to someone or something and continue on in life without their presence. Mayhim Bialik reflecting of the recent loss of her father shared that : “Grief is chaotic. It mushes up your brain and makes it hard to think straight, and see straight, and talk right.” Greif is really hard and often isolating. But it is also real and necessary and as C.S. Lewis writes: ‘the price we pay for having loved”, and when we grieve we honour that love. Greif takes time. Our culture tries to pretend that it is quick and easy, that a couple of days or weeks or even months and then we return to what we once were. That is a myth – grief is not a moment is it an experience, it is not linear, it comes in waves, it ebbs and flows – sometimes it paralyzes us and sometime it gives us joy as we are suddenly surrounded in a delightful memory. Greif is what David is experiencing this morning, and his response, the “song of the bow” is his lament for his loss. There have been 14 chapters of story between last week and this week – a lot happens to this young man who slayed a giant with a small smooth stone to this grieving lament of loss for Saul and Jonathon. The boy /child has grown up. He is now a soldier, and a husband to at least four woman. The circumstances of David’s life are incredibly complex, gone is the simple life of the shepherd and it has been replaced with a complex relationships, palace intrigue, deceit, and general mayhem. Game of Thrones has nothing on the Book of 1st Samuel. If you have a couple of hours this afternoon I invite you to pick up your bible and read through chapters 17-31, and try to follow the complicated meanderings of intrigue, plotting, conspiracy, scheming and maneuvering that was the relationship between King Saul, David and Jonathon. Immediately after David removed Goliath’s head, and presented it to the king, life as David knew it changed. King Saul was impressed with this boy who defeated the giant Goliath, and how he showed his admiration and gratitude is that he binds David to his son, the crown Prince – Jonathon, kind of like a gift of a brother and friend to Jonathon. David and Jonathon hit it off and immediately become best of friends; the language of the bible writer’s use leaves the impression that this is an intense intimate relationship between these two men. David and Jonathon then became leaders in King Saul’s armies as the Hebrew/Philistine wars continued. All too soon, David’s successes outnumbered Jonathon’s as did his popularity. David was one of those charismatic, popular guys who excelled in what he did, and people noticed and praised him. King Saul heard all the positive attention that was being heaped upon David and did not hear so much about his son, and very soon Saul began to resent David, become suspicious about David and began to conspire against him. Now King Saul, if you read between the lines through the last 14 chapters of 1 Samuel presents as unpredictable, volatile, erratic, self-absorbed, corrupt and quite possibly crazy king. He begins to send David off to fight unwinnable battles, placing him in dangerous positions – but David prevails – prevails and triumphs. Into this mix of war intrigue and battles there are the personal manoeuvrings as well. David marries Miceal who is King Saul’s daughter, which further embeds him in palace scheming’s and family dysfunction. Soon both Michael and Jonathon are being forced to choose between loyalty to their father or to David. Finally – David is hold up in a cave, Saul hears and goes to the cave to confront and kill David – David creeps up behind Saul and cuts off a small square of his cloak – when Saul emerges from the cave, David in a fit of remorse, follows Saul out and calls to him, says I could have killed you but I didn’t – here is the turning point – and Saul shifts his behaviour – weeps and asks for David’s forgiveness. David prostrates himself on the ground and pledges to never kill either Saul or any of Saul’s descendants. Saul returns to his stronghold and David goes back to battle the Philistines. And then – the ultimate tragedy – all of King Saul’s three sons are captured by the Philistine in one day – and they are all executed – when Saul finds out – he orders his shield bearer to kill him, and when he refuses, he falls upon his own sword – dead – the King and three sons – a tragic day for the Hebrew people. I think this is a great example of good grief – there are so many different ways that David could have responded to this situation – he could have rejoiced that the crazy king who was out to get him had finally met his demise. He could have just ignored it all, breathed a sigh of relief and gone through the rest of his day. He could have reacted in anger vowed vengeance and ran headlong into another battle with the Philistines – but instead, he took time, he recognized his complicated feelings and he allowed his emotions to be real, and he felt them and then produced this song of lament that he shared with Saul’s kingdom who would also be looking for ways of expressing their grief at the loss of their king and his sons. Good Greif may look like a woman who has been outcast from her society for 12 years reaching out to touch Jesus cloak– here is a woman who has used up all her resources in order to find healing and has been unsuccessful. This woman she has an ailment that makes her an “untouchable”, someone who is not allowed to be in proximity of others. In her day, because her period never stopped, she had perpetual bleeding – she was considered unclean and segregated from everything. After failing to find a cure, and using up her resources she would have been reduced to begging in order to survive. I imagine this life looks a lot like a homeless person whom has a mental illness or addiction that causes behaviours that alienate those around them. Good grief looks like a hand reaching out to touch hope – to grasp at possibility – to reach for a chance, any chance at all to find healing and restoration. Good Grief may sound like President Obama’s Eulogy at Rev. Senator Clementa Pinckney, memorial service where he says: “We do not know whether the killer of Reverend Pinckney and eight others knew all of this history. But he surely sensed the meaning of his violent act. It was an act that drew on a long history of bombs and arson and shots fired at churches, not random, but as a means of control, a way to terrorize and oppress. (Applause.) An act that he imagined would incite fear and recrimination; violence and suspicion. An act that he presumed would deepen divisions that trace back to our nation’s original sin. Good grief is not about naming and shaming and blaming but instead pausing in the midst of life and holding up the gifts, the grace, the goodness and the possible positive potential that can come from the loss – like forgiveness and shifting values and confederate flags no longer being on display at federal buildings. Good Grief looks like David – stopping in the midst of the craziness that is his life and the all waring with the Philistines and the palace intrigue and mayhem and lamenting – and singing the ‘song of the bow’ and then teaching the song to others so that they too can express in some way their loss, their pain, their sorrow, their fear and bewilderment. This is what good grief is – it is action, it is acknowledgement, it is recognition of all the emotions that are being felt in the moment and each of them whether they are beautiful or ugly – every emotion that we feel, every tear that falls, every moan of anguish, every catch in our breath – is part of the grace that comes. Good grief – looks like the executive committee getting together with presbytery to talk about next steps and possibilities. Good grief looks like being open and asking questions, and bringing concerns and feelings into the open, and not having ‘parking lot meetings’ or private phone conversations that are destructive. Good grief is trusting that God is in this midst of this and guiding this process and that somehow between now and September we will as minister and congregation walk into the next steps of ministry, trusting that God is with us we are not alone and that all will be well. Good grief is reaching out to grab hold of Jesus cloak and experience that healing presence and knowing deep deep within ourselves that we are God’s beloved child, thanks be to God…Amen.